Sleeve gastrectomy, also referred to as vertical sleeve, gastric sleeve or tube gastrectomy, is a surgical procedure performed for the treatment of obesity. The procedure is a restrictive bariatric surgery to treat extremely obese patients with a high BMI of 40 and above. It encourages weight loss by restricting the stomach size, so it holds only a limited amount of food. This helps patients to eat less without hampering the normal digestive process. Sometimes sleeve gastrectomy is carried out as a first stage of a two-stage operation in extremely obese patients with a BMI of 60 or more. This is done to achieve a considerable amount of weight loss, so it is safer for the patient to undergo a second bariatric surgery if needed. 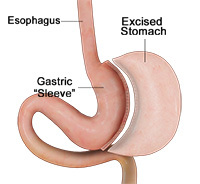 What Happens During a Laparoscopic Sleeve Gastrectomy Procedure? The procedure is performed under general anesthesia. The surgeon makes 2 to 5 small incisions on your abdomen. A laparoscope, a thin instrument with a light and camera attached, is inserted through one incision, allowing your surgeon to clearly view the internal organs on a monitor. Additional surgical instruments are inserted through the other incisions. Your surgeon will remove nearly 75-80% of the stomach. A thin sleeve shaped like a banana is created by stapling the remaining part of the stomach. At the end of the procedure, the incisions are closed with sutures. The entire procedure takes about 60 to 90 minutes to complete. Stomach portion that produces hunger stimulating hormone (Ghrelin) is removed. Potential is higher for inadequate weight loss or weight regain compared to intestinal bypass surgeries. Your doctor will prescribe pain relieving medications to keep you comfortable following the procedure. You will be advised to take medication to reduce the amount of acid produced by your stomach. Sip water throughout the day to prevent dehydration. Eat a highly nutritious diet rich in proteins with a low-fat content. Your dietitian will tailor a new diet regimen for you to follow. As with any surgery there are potential risks involved. The decision to proceed with the surgery is made because the advantages of surgery outweigh the potential disadvantages. It is important that you are informed of these risks before the surgery takes place. Most patients do not have complications after sleeve gastrectomy surgery; however, complications can occur and depend on the patient's health status. Complications can be medical (general) or specific to sleeve gastrectomy.